DIY Bath Fizzies & Bombs | The Food Hussy! 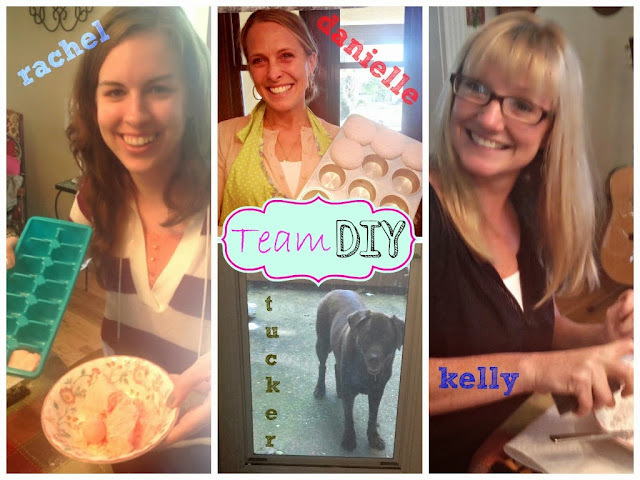 I regularly get together with my girlfriends and have a DIY day. I love doing crafts on Pinterest but it's not as much fun to do alone! Plus - if you have a group - you can share ideas and help each other! I found these great do-it-yourself bath fizzies from Martha Stewart and thought, "Sure - we can do that!" Well...we tried. Here's the DIY crew - Tucker is by far the most important quotient of the equation. :-) Kelly was the first friend I made here in Cincinnati and Danielle and Rachel are friends from bible study. You mix a few ingredients together (recipe at the end) and let me warn you it's a delicate balance. You're stirring a mixture of baking soda, cornstarch, citric acid and water. As you add the water - that's when the magic happens. But - the point of a fizzie is for it to fizz when you put it in your BATH. Danielle had another idea with her fizzy bath bombs - she decided to detonate them while making them! When you add too much water too quickly - they explode. Danielle is also impatient. 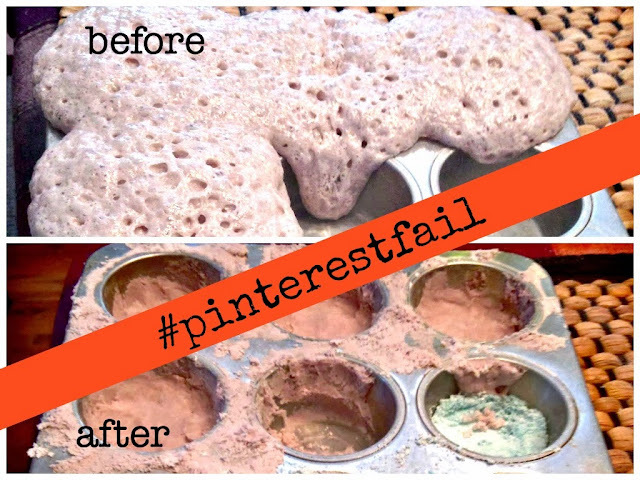 Put it all together and you get a #pinterestfail. Rachel, Kelly and I took a cue from her and made sure to take the process REALLY slowly and go easy on the water. In the end - we had a few bath bombs and a couple of bags of bath fizzie mixture. I don't know how Martha does it - but let's be honest - it's probably an assistant that does it. We didn't have the baking molds like she displays in her tutorial so we tried using cupcake tins and ice cube trays. I thought about spraying them with cooking spray first but then didn't know if that would mess up the fizzy - so I didn't. It was pretty tough to get them out in whole pieces. That said we ended up taking the ones we couldn't get out and just making it bath fizzy crumbles. They still work in the bath and add a nice aroma and fizz to the water! Best of luck on your DIY fun! 1. Sift 1 3/4 cup baking soda with 2 cups cornstarch and 1 cup citric acid through a sieve to remove chunks. (I just had a small hand one about the size of 2 ice cream scoops - it worked fine.) To make different colors - fill small spritzer bottles with water and add about 6-10 drops of food coloring to each. 3. Select an essential oil - add 5-6 drops (less for strong scents like mint/lavendar, more for weaker fruity scents). Mix well. Firmly pack into the baking molds. They recommend using 1/4 cup for each fizzy which is about the right amount for one bath. Allow the mix to set for 2 hours and then pop them out carefully. The mixture made A LOT - we had plenty for all 4 of us to split - there was a dozen cupcakes and 2 ice cube trays plus a baggie full. I will typically double when needed but this definitely was not one to double - especially until you've tried it once. All in all - even with our #pinterestfail - we had a great day and enjoyed making these - I hope you do too!